Earlier this week the new $12 million dollar Rave Cinemas opened at the newly renovated Baldwin Hills Crenshaw Plaza. The site was once home to the Magic Johnson Theater, which opened in 1995, only a year after the nearby Baldwin Hills Theater closed for good. The Baldwin, the original neighborhood movie house, opened in 1949 at La Brea and Coliseum and boasted nearly 2000 seats and a distinctive neon-lined façade pierced by two giant arches. Movie premieres, church ceremonies and even high school graduations took place in the hall. The flashy landmark endured rocky times and closed and reopened several times. The ruins sat on La Brea for several years before the vaulted auditorium was recycled into a Chase Bank and surrounded by new construction. The original theater is unrecognizable so I had not really paid much attention the new shops. I recently had a sandwich at the not-so glamorous “California Steak and Fries Halal” restaurant in what was once the forecourt of the theater and noticed a handful of concrete slabs near some outdoor benches. They were a different tone and texture than the rest, and turned out to be signed hand and foot prints a la Grauman’s Chinese! What a neat surprise! 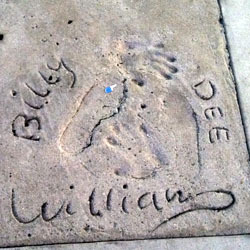 You can compare your shoes with those of 1970s African-American film greats like Billy Dee Williams and Pam Grier. I’m glad the landlords of the sandwich shop retained them. Perhaps the Rave Cinemas will pick up this fine tradition or at least finally bring quality movie entertainment to South Los Angeles. Hopefully they will pick up where the Baldwin Hills left off.